Not long till Pancake Day! Are you looking forward to it? Will you be making any pancakes? Last year I made delicious almond and baobab pancakes and this year I came up with even better recipe – gluten-free, dairy-free, high protein almond and coconut pancakes. It was a challenge actually – Holland & Barrett invited me to join their Blogger Protein Pancake Challenge and since I love experimenting in the kitchen I decided to get involved. 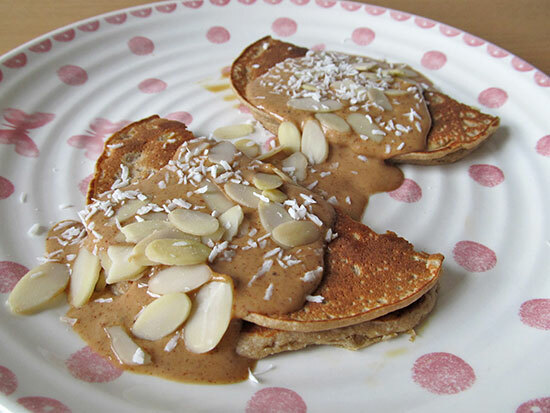 The task was to create healthy protein pancakes using some of Holland & Barrett ingredients. So how do you create protein pancakes? You obviously need eggs which are a great source of protein and to add additional protein you would need to use high protein flour instead of your normal wheat flour. Finally, you make a high protein filling and topping to cover your pancakes with. I was given a coconut flour to experiment with which is gluten-free, high in fibre, low in sugar, digestible carbohydrates and calories, and has a low score on the glycemic index (1). Coconut flour is made of pure coconut and contains high levels of healthy saturated fats in the form of medium chain fatty acids (MCFA). The flour I used contains 6.9g of protein per 100g which it’s higher than the protein content found in wheat flour. Coconut flour is also lower in carbs comparing to traditional grain flours. 100 g of coconut flour contains 24 g of carbohydrates, much lower when you compare it to wheat flour! If you want to reduce your carb intake, coconut flour is definitely worth considering. You won’t believe how many pancakes I made in the past few weeks! I blame coconut flour.. I quickly learnt that making pancakes with coconut flour is not easy. I tried so many different variations and failed. Many times. 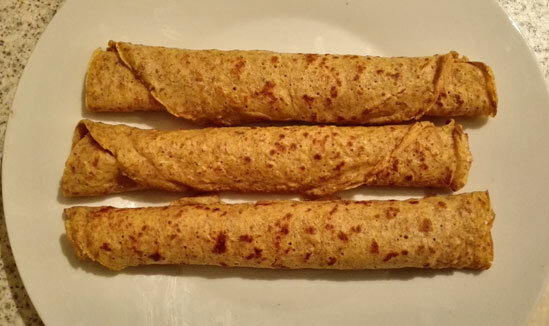 I first tried making thin pancakes, using just coconut flour instead of wheat flour. BIG failure. You just cannot do it. Pancakes just fall apart and crumble. It doesn’t work. 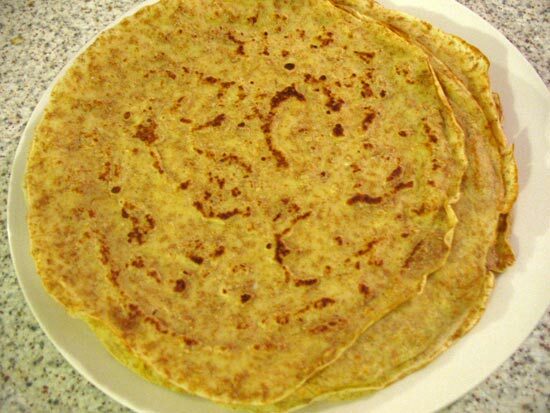 I thought that I could maybe make thin pancakes with coconut flour if I add some other type of flour as well. So I used gluten-free oat flour. Did it work? No! But almost.. It was better than using coconut flour only but still, pancakes were delicate and were falling apart. At the end I figured it out. I needed to make thick pancakes. Duh! And yes, mixing oat flour with coconut flour was a good idea. I failed at making fluffy pancakes so I decided to go for smaller but thicker pancakes which held their shape and didn’t fall apart once I turned them around in the pan. What about a high protein filling/topping? That was easy! Using almond butter as a base was perfect and with a bit of experimentation I managed to create a perfect topping. Enjoy! Crack the eggs into a larger mixing bowl, add a pinch of salt, plant-based milk and vanilla extract. Whisk all together until well combined. Add the coconut flour, oat flour and ground almonds and whisk until smooth. Melt 2 tablespoons of coconut oil and add warm oil to the mixture while you are whisking. You could leave the batter to rest for a bit or you could just go ahead and start making pancakes. Heat up the pan over a medium-high heat. The pan shouldn't be too hot. You can add a few drops of coconut oil to the pan for the first pancake. When the pan is ready take about half of a ladle of a batter and add it to the centre of the pan. There is no need to tilt the pan and move the mixture around as you want the pancake to be thick. Wait until you see little air bubbles starting to appear on the pancakes. As soon as you see those bubbles, you know that the pancake is almost ready to be turned around. Gently push it until it doesn't stick to the pan anymore. Now it's time to turn it around. Cooking on the other side doesn't require much cooking. Maybe about 10 seconds. Repeat the process for the rest of the pancakes. 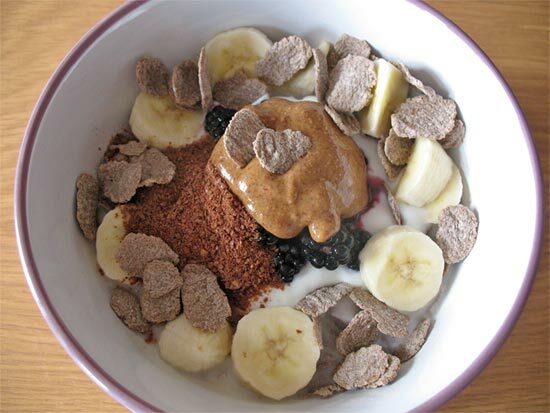 To make the 'sauce' add two tablespoons of almond butter into a small bowl. Add the milk and whisk gently until it's all well combined. Then add the lucuma powder (or other sweetener) and date syrup. Whisk all together until smooth consistency. To serve the pancakes, first add a drizzle of a date syrup on one side of a pancake. Then fold the pancake in half and top it with almond sauce. Finally, sprinkle the pancake with flaked almonds and desiccated coconut. So yummy! If the pancake base is too thick, just add a little bit of plant-based milk and if it's too thin, just add some more oat flour. If you don't have lucuma powder to sweeten the pancakes you could use date syrup, honey, maple syrup or coconut sugar instead. When making the almond sauce, you can add more or less plant-based milk. It's up to you how thick you want the almond sauce to be (although you don't want it to be too runny). You can skip the toppings if you don't have them (or use something else), it just adds a nice crunch and flavour to the pancakes. Disclaimer: While Holland & Barrett provided the ingredients for this recipe I have not been compensated in any other way for my time and effort it took to create this recipe. These look amazing-mine always fall apart! I had many failed attempts before I learnt coconut flour should be mixed with other type of flour, only like this the pancakes don’t fall apart! Such a shame you cannot eat nuts, they are so nutritious!